Aziak Island (also called Azki, Azlak, Azik, and Azaik) is a small island in the Andreanof Islands group in the Aleutian Islands of southwestern Alaska. 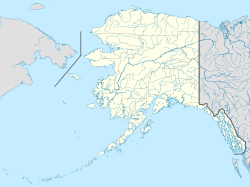 The name "Aziak" is derived from the Aleut word ha-azax - "ten," and in many books and charts published before 1920, it was often used to refer to Sledge Island, located 930 miles (1,500 km) to the northeast off the Seward Peninsula, or to a native settlement on that island. This practice apparently became rarer as the twentieth century progressed and today Aziak is used almost exclusively to refer the Andreanof-group island. Aziak Island is approximately 1.1 miles (1.8 km) long and reaches a maximum elevation of 190 feet (58 m). Very little is known about the island and it is uninhabited. ^ Bulletin - United States Geological Survey. United States Geological Survey. 1906. Retrieved 2008-09-25. ^ Bright, William (2004). Native American Placenames of the United States. University of Oklahoma Press. ISBN 978-0-8061-3598-4. Retrieved 2008-09-25. ^ Seal and Salmon Fisheries and General Resources of Alaska. US Government Printing Office. 1898. Retrieved 2008-09-25. ^ "Aziak Island". Geographic Names Information System. United States Geological Survey. Retrieved September 25, 2008. This article about a location in the Aleutians West Census Area, Alaska is a stub. You can help Wikipedia by expanding it. This page was last edited on 20 February 2016, at 01:27 (UTC).